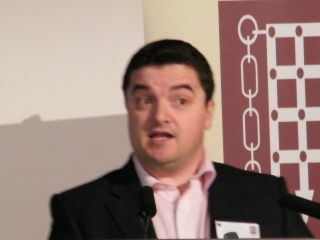 Smartphones' all singing all dancing days may be over, according to RIM's UK MD Stephen Bates. Despite handsets' rapid technological evolution, from improvements in display quality to turbo-charged multi-core processing power, Bates suggests that tablets may nudge them back to being pure communications devices. Speaking at a seminar on the future for mobile in London this morning, Bates commented, "We're all now used to having smartphones and the instantaneous appeal of social interaction, but now we're looking for more from our devices – more media and more consumption." He continued, "Demand is being met by smartphones for now, but the form factor isn't ideal. "We're going to see a change in behaviour; the tablet is going to come in as a media device and we're going to see the smartphone drifting back to pure communications." Don't worry though; RIM isn't keen to send us back to the dark days of the dumbphone. These days, 'communication' refers to a lot more than just calling and texting, and RIM is keen to cite its social networking credentials. "These days, you hear a lot about apps but at BlackBerry we have a wider focus. We're about delivering the ultimate communications platform, including social networking," said Bates. "We have more users of Twitter on BlackBerry than any other platform, and Facebook has told us that BlackBerry users are three times more interactive on Facebook than any other device users." It's not entirely surprising that a company which hasn't exactly displayed media prowess on the smartphone but is jolly good at email and messaging would suggest that music, video and books shouldn't be the smartphone's focus. We can't quite bring ourselves to agree with Bates' general crystal ball gazing, but his comments could be a good indicator of where BlackBerry handsets are going with the advent of the RIM's first tablet, the BlackBerry PlayBook.